Male Mount Name "Star Helper" Female Mount Name: "Cart Carrier W"
There is a SLIGHT difference between he wheels in the mage (female) mount, tell me which one actually looks better between the 2, notice that there's no steering wheel, they're automatic carts, the mage concept just kinda came to me, I tried doing it to a sage, but the sage sprite is really hard to put together the right way to get the legs in the right position, the mage sprite came as is, so that was quite lucky. 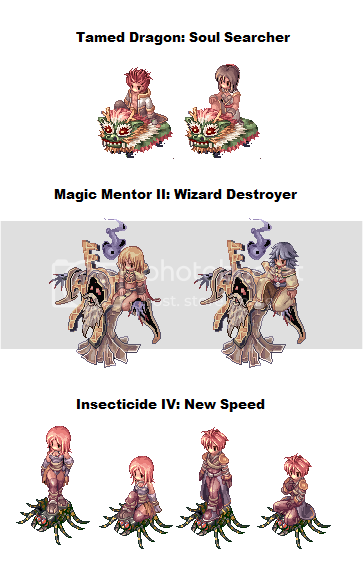 For some reason I thought it would be better for the gender mount for the mages to be different...don't know why though, and yes, I did make the mage (female) sprite. I tried hard, but the way I came up with the dragon was from Dragon Ball Z's Shenron and the fact that monks use a skill similar to Ka-me-ha-me-ha. The way I came up with elder for sage was the way the elder looks, because the sage does look like a wizard/sage and the fact that that's the only monster I was able to think of for a sage to sit on, and the fact that my imaginaion's a little.....poor. The giant spider I came up with for the assassin class was the fact that spiders can be poisonous like the sin, and that spiders are almost always sneaky, just like the sin (using cloak), plus, the spider uses 2 fangs and the normal sin attacks with 2 hands. Sitting or standing, tell me which is better for the sin. Edited by lOOlOOlOl, 30 May 2011 - 04:39 PM.